So today I’m talking biscuits! Random I know, but I’m headed to Honduras in 2 weeks so today I made a few meals and other items to put in the freezer for my husband to make when I’m gone. I saw this somewhere on Pinterest and decided to try freezing my own biscuit dough a couple of months ago. It worked great so I’m doing it again! My mother in law gave me a yummy recipe so I’m going to share it with you. I’m sure this would work with other recipes so if you have one you love, make it then follow the freezing instructions. 1 cup buttermilk or you can substitute “sour” milk (1 tbsp vinegar or lemon juice add milk to equal one cup of liquid. Let sit on counter for 5 minutes before using)Mix all dry ingredients together. Work in the butter with a pastry cutter. Once the butter is incorporated well, pour in your milk and mix together. 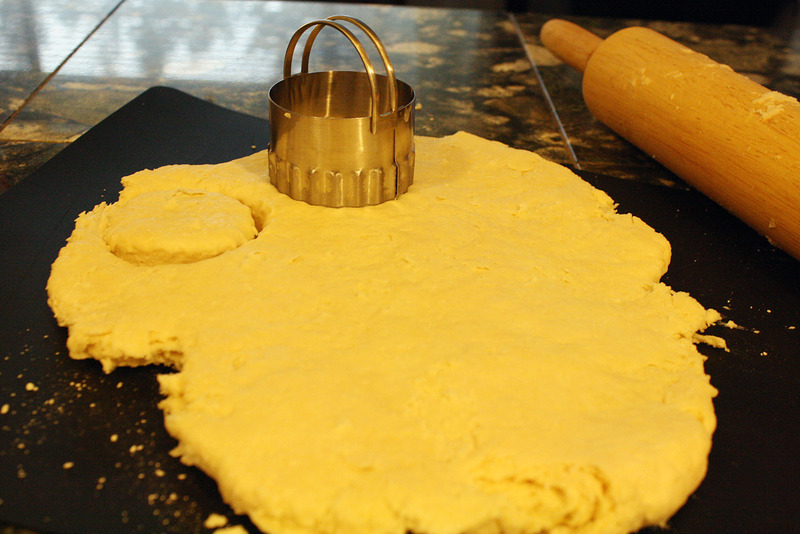 Knead dough on the counter then cut biscuits. If you are going to eat them right away heat your oven to 425 degrees and bake for 10-12 minutes or until golden brown. Line baking sheet with freezer or wax paper. 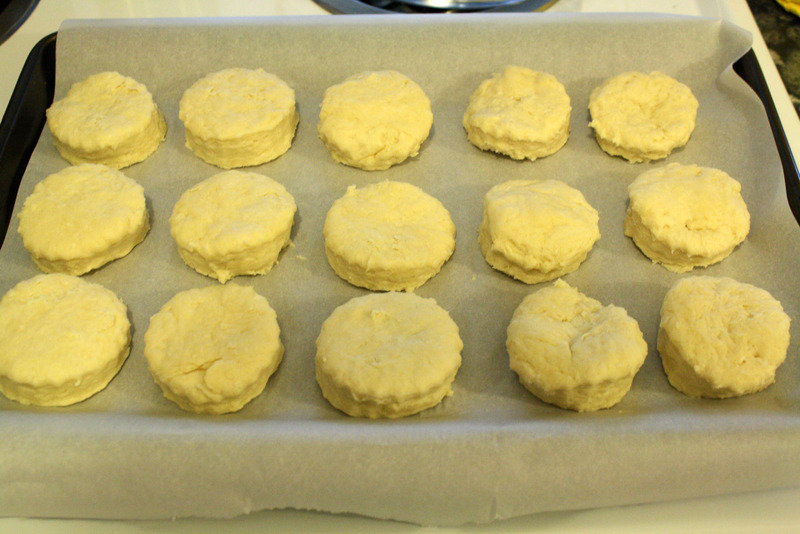 Cut biscuits and place on the paper. Make sure they aren’t touching. 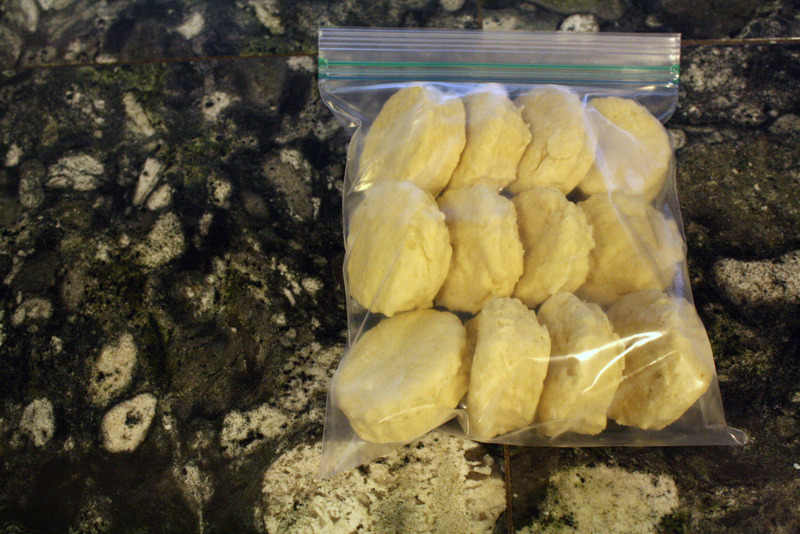 Flash freeze them on the baking sheet for one hour. This will help them not stick together when you place them in the bag. After the hour is up place them in a freezer bag. To bake after they are frozen, let then thaw at least partially or place them on a plate and microwave them for 10-15 seconds or until they are slightly soft. Then bake at 425 for 10-12 minutes. I love doing this because it’s a better option than grabbing a container of Pillsbury biscuits. We don’t eat very much processed food so it’s nice to have a few things ready to go for those nights that you don’t want to do all of the prep!